"Amanda's getting a sister!" the email subject-line read, and Jon could suddenly not read the rest of the email over the shrieks of joy from the peanut gallery. The email was from Amanda's good friend Rachel Mather, saying she'd love to come visit for 6 weeks in South East Asia. 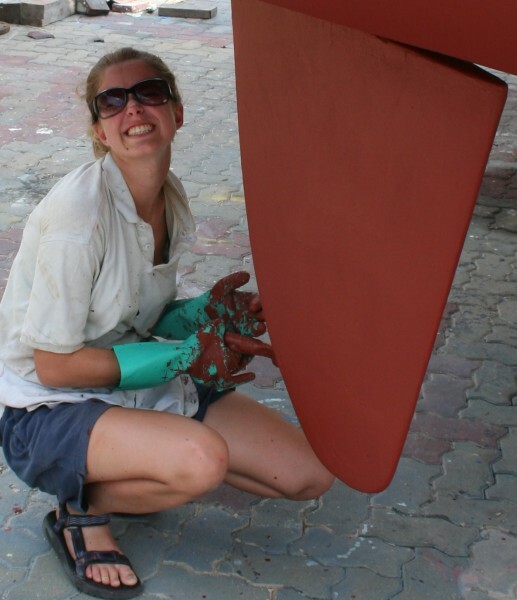 We first met Rachel in St. Maarten in 2002 when she was 13, sailing around the world with her family aboard their 51 foot (15m) aluminum sloop, Vamp. The girls hit it off right away (as did the parents) and Amanda and Rachel stayed in touch by email for a year as Vamp made her way to Nova Scotia and back south to Panama. We met up again in the San Blas Islands, transited the Canal together, then sailed to Ecuador. There, the families took a week-long jaunt into the Andes together. A month later we parted company in the Galapagos - we stayed longer to be with Jon's brother Tony, and Rachel and her family continued on across the Pacific to finish their circumnavigation in Brisbane, Australia. During Ocelot's stay in Brisbane in 2005-2006 we saw Rachel and her family often, either at their home in Toowoomba or on Ocelot. What a great joy it was to learn that Rachel wanted to come visit us on her summer break from university! Timing was perfect, as we would be in SE Asia for several months, making our way up the Malay Peninsula from Singapore to Thailand. Having a friend visit was just what Amanda needed as we'd had a dearth of teens for many months while we sailed through Indonesia. It also gave Amanda an excuse to have her first real "summer" vacation in 5 years. What with our visit to the States, Rachel's 2-month visit, and Chris's return to Ocelot from university for an overlapping 3 months, Amanda eked out a good 3-month break from school work! 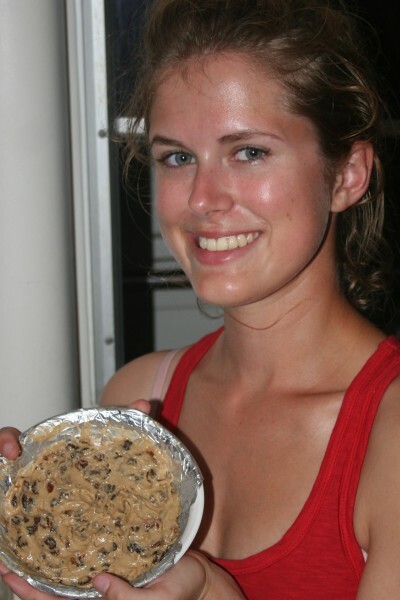 Being an experienced world traveler, Rachel didn't blink at having to change her original plans from meeting us in Phuket, Thailand, to Singapore a day later. We picked her up at the airport (at 2 in the morning!) the day after our return from the States. She settled into the starboard aft cabin, the nominal guest cabin, which she kept neater than any of us do! Thanks Rach! the chairlift ride back up was not. 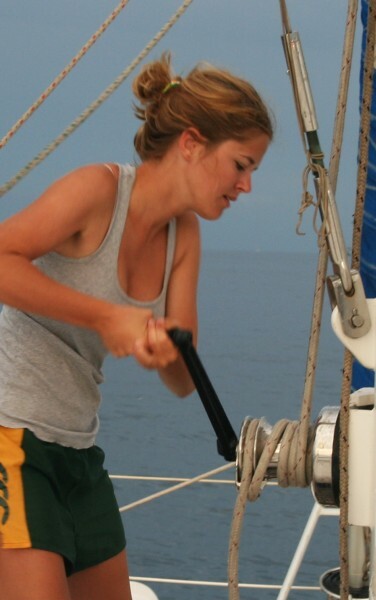 Being a yachtie through and through, Rachel knows that boats take work and cooperation, so we knew she'd understand that life aboard isn't all fun and games. It was wonderful to have a guest that just liked doing the boat stuff with us, hanging out somewhere, and going with the flow. Of course, having been off Ocelot for a month meant there was lots of work to do right away. Rachel's first full day aboard was spent helping us wipe the mildew off the headliners and bulkheads -- a necessary chore after leaving the boat closed up in rainy season! Lucky for us, Rachel actually likes to clean! While still in Singapore we had several major things on our Things To Do List: End-for-end the topping lift, put the jib back on the roller gear, scrub the chain locker and re-lay the chain, clean the decks and interior, sightsee, and shop. Rachel and Amanda helped Jon change the topping lift, then Rach gamely climbed into the chain locker for some real gritty, grimy cleaning. Once the boat chores were done we dedicated several days to exploring Singapore. Mandy and Rachel fell right into the teenage role of prowling the malls (of which there are dozens in that modern city!) and poking around the interesting shops and streets of Little India and Chinatown, accessed by the widespread Mass Rapid Transit train system. We spent a day on Sentosa Island with its amusements (like riding the luge, which Rachel loved, and the Sky Tram, which she hated), and reading every display sign in the museums that cover WWII and the history of Singapore. 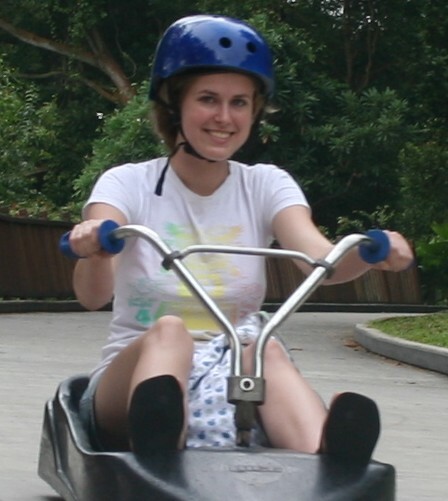 Rachel had already visited Singapore with her family many years earlier on their circumnavigation, but they had not gone to the museums, so it was fun to take her somewhere new. It was still the rainy season, which meant thunder clouds rolled in most afternoons, but by the time we were ready to leave Singapore they'd mostly disappeared - a foretelling of the beautiful sunny skies we were to enjoy the entire time Rachel was with us. Painting Christmas stockings for Chris and Rach. In early December we set sail to head up the Strait of Malacca, spending several days en route to Port Dickson. The sea was flat, giving Rachel a chance to get her sea legs on a catamaran and a chance to start "learning the ropes" aboard a boat very different from her dad's. From Port Dickson we took a taxi south to the city of Melaka (Malacca), where we spent two days sightseeing and gift shopping in the wonderful little shops and the gaudy big new mall. Although Malaysia is predominantly a Muslim country, there are many Christians (mostly in the Chinese community) so there was a festive feel to the city. Actually, Melaka probably looks festive all year round, with its colorful temples and trishaws decked out in flowers and loud music. We also got to see the hand-beaded shoes which Melaka is known for, and one shop which still makes tiny shoes for bound feet. Ouch! They look more like something you'd put up as a decoration than something you'd wear! 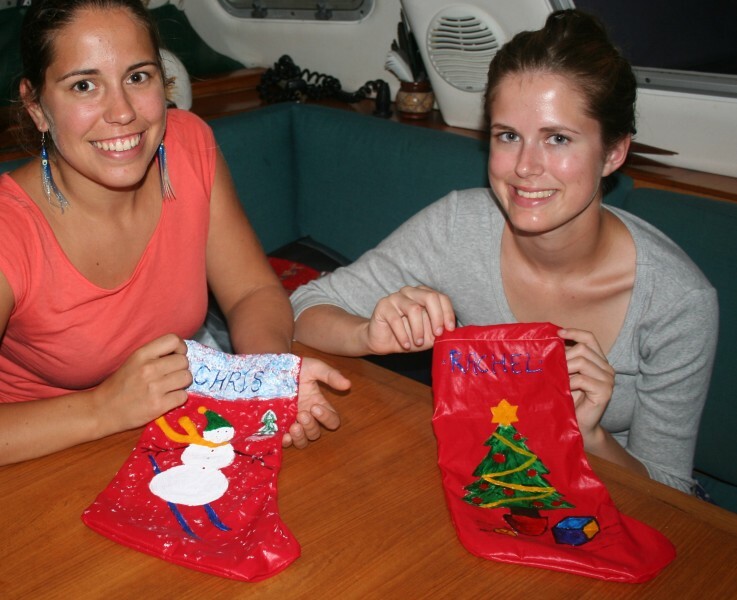 Back on Ocelot, Rachel and Amanda got into the holiday spirit by baking fruit cakes and sewing and painting new Christmas stockings for Chris and Rachel. They pulled out our tiny plastic tree and decorated it with seashells and small hand-made souvenirs of our travels , including a small spice basket we got in Melaka which Rach wouldn't be able to take back into Australia. This was our only real time to prepare for Christmas on Ocelot, since the five days leading up to it we'd be traveling inland. We explored Penang for a couple days, including an evening at the top of the funicular where a pit viper lived in the trellis over our dinner table, much to Rachel's shock! Another evening Jon and Sue went out for dinner, leaving the girls on the boat to play loud music and search for their dream boat, Scoots, on the internet. Then we continued north to Langkawi where we met up with friends on Scud. Both families were awaiting the arrival of our sons for long visits. On December 20, Rachel, Jon, Amanda and Sue traveled by ferry, bus and train for 12 hours to Kuala Lumpur where we were so thrilled to be welcomed at the home of new Malaysian friends, Sulynn and her daughter, mother, and sister. Christmas festivities were in full swing both at the house and in the city, getting us all in the mood for the holidays. Christopher flew in on the 21st, and on the 22nd we took a rental car deep into the mountains east of Kuala Lumpur to an elephant preserve. What a treat! 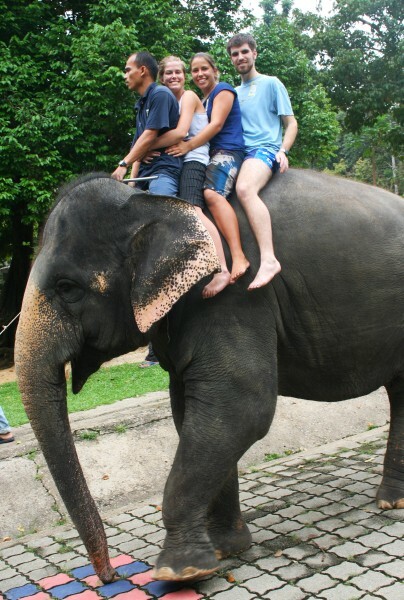 We knew that Chris would love to be with the elephants and bathe, feed and ride them, but we had no idea what a thrill it would be for Rachel as well. Turns out she adores elephants, and wished we'd stayed longer in so she could volunteer at the preserve! Chris, Amanda and Rachel were picked to ride one elephant into the river, a much longer ride than the simple circle everyone else had done earlier. And once in the river, the elephant leaned over and they all went for a swim! 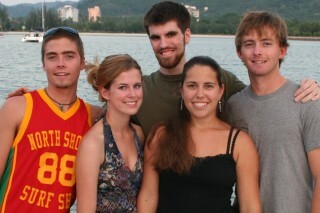 Warren, Rachel, Chris, Amanda and Adam. After another grueling trip via bus and ferry we arrived back on Ocelot late on the 23rd. Christmas Eve we spent on last minute shopping and wrapping presents. It was not unlike the last-minute craziness in the States or Australia, but it all had a Malaysian flavor. We spent Christmas morning (and late morning, and noon, and early afternoon) opening all the little "pressies" (an Aussie-ism) we'd gotten for each other, then had a big dinner with Scud. We knew it was hard for Rachel to be away from her family at this time of year, but we were so appreciative of her family letting her visit! She truly did feel like part of our own family. Such a game yachtie girl! The lovely part about hauling at Rebak is that it's a nice marina with a cheap restaurant, nice gardens, wild life (monkeys, though, not being one of Rachel's favorites!) free wireless internet, and a swimming pool. We were thrilled that Scud tagged along to the marina, so after each hard days' work the kids could head for the nice swimming pool, dance to the live music in the evenings, and just hang out together. By the time New Year's Eve rolled along we were anchored in lovely Telaga Bay under towering cliffs, and were joined by yet another cruising family on Faith. It was suddenly young adult time: Chris, Amanda and Rachel on Ocelot, Warren and Adam on Scud, and another Amanda and Emily on Faith. The "kids" took long hikes in the hills of Langkawi to the waterfalls and rainforest trails, stayed up late exploring ashore, picnicked on the beach with all the families and generally had a great time. Choosing veggies from the market. We welcomed 2007 in by sailing together with Scud into Thailand. Finally, at Koh Rok Nok, we had our first snorkeling adventure with Rachel at an anchorage she remembered from years before. It was then we learned of her desire to take a scuba diving course, which we thought was a great idea, seeing as how we're all divers. Before getting to Phuket we did a fair bit of island hopping with some nice day sails, and walks around Koh Phi Phi Don where the tragedy of the 2004 tsunami is always present, even with all the new construction and prolific tourism. We attempted to dinghy around Phi Phi Le, where the rather dark movie "The Beach" was filmed, but half-way our usually reliable Mercury outboard seized up and refused to run. Luckily a day-tripping longtail from Phi Phi Don towed us back to Ocelot. It's a good thing we didn't decide to circle the island starting with the south end - no boats go there, and we might have drifted a long way before someone came to help. 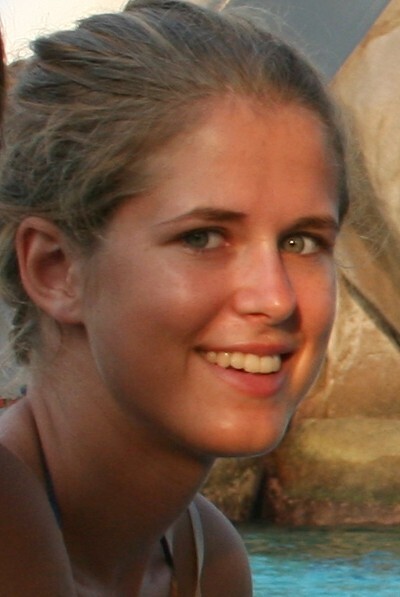 Rach was scheduled to fly out on Jan 15th, and that was approaching fast, but once in Phuket she hopped onto the Internet and rescheduled her ticket, then sent an email to Mum and Dad saying she really missed them but would actually like to stay on Ocelot a bit longer - and could they please put more money in her account. Smiling happily with credit card in hand, she marched off with Adam and Warren to get scuba certified. On non-diving days Rachel was usually game for a round of Scrabble or Frustration aboard Ocelot or with the Scud boys. 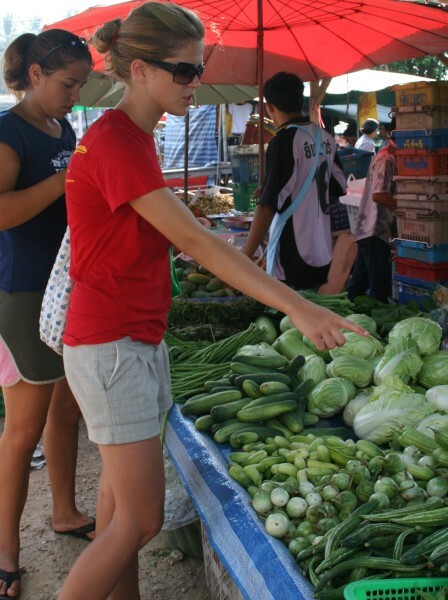 When Sue could grab the girls away from the guys, Rachel and Amanda were a great help at the local markets, choosing fresh fruits and veggies, and steadfastly refusing to try the dried crickets, frogs and cockroaches that were for sale. Jon was taking advantage of the boating businesses in Ao Chalong to fix our two engines - one of Ocelot's had spat out all its perfectly good oil, plus the dinghy outboard needed fixing - but our cruelty to visitors does not extend to having them head down mopping oily bilges. Rachel's participation in the repairs was largely tending to her friend when Amanda got a jugful of used engine oil over her head. Somehow she couldn't understand Amanda's hysterical laughter - "I would be bawling!" she cried repeatedly, until Amanda told her to stop because tears weren't far away. In Phuket we met up with another cruising catamaran, Mahi Mahi, who had a college-age niece and friend aboard so the partying got into high gear! We all sailed NW to the Similan Islands National Park where we were so happy to finally get both Chris and Rachel (and us!) to some gloriously clear water and vibrant coral reefs. The winds were light on our way there, but just to keep our crew in good shape we insisted on putting up the mainsail. Rachel found out just how heavy our main is and how many turns on the winch it takes to get it all the way up! You go girl! We spent some wonderful "yachtie days" in the Similans with Amanda and Rachel baking and cooking, visiting friends, exploring, snorkeling, and diving. Once the winds picked up again we headed south to Phuket, where we anchored off the little resort "town" of Nai Harn. 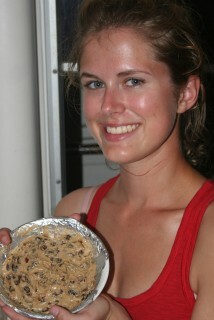 We shared some great meals ashore, with Rachel somehow figuring out what to eat that wasn't curry! While there, Amanda, Warren, Adam and Rachel all got their advanced scuba certificates, making a deep/wreck dive, a drift dive, a navigation dive and night dive. 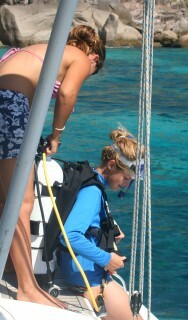 The water wasn't the clearest, but for Rachel it was all new! She was so game to do it. Rachel & Amanda, friends as good as sisters. From Phuket we sailed NE into beautiful Phang Nga Bay where we cruised with Mahi Mahi for a few days. Together we took our dinghies into "hongs" (limestone grottos open to the sea) and anchored off the famous James Bond Island featured in "Man with the Golden Gun" which Rachel and Amanda correctly pegged as a tourist trap. We sailed almost every day, spending time in the north at a floating Muslim fishing village and touring the backwaters in a local "longtail" boat one morning. The fun and beautiful scenery continued as we sailed to Krabi, a bay famous for its rock climbing. No climbing for us, but there were beautiful beaches and nice walks to enjoy by day. At night we ate ashore at the lovely inexpensive restaurants, where Rachel steadfastly stuck to fried rice and chicken with cashew nuts, and then the "youngsters" went out to find what night-life they could, often returning long after lights were out on Ocelot. Those lovely carefree days were brought to an abrupt halt by the approach of the day of Rachel's departure. She sadly said goodbye to new-made friends on Mahi-Mahi and Scud, and we sailed back to Phuket. Her last days on board were spent in a marina, the way the first ones were - scrubbing dirty lockers, this time to help Jon disassemble the steering gear. Finally, having put off the inevitable for long enough, we drove to the airport to see her off. Our month in Singapore/Malaysia and month in Thailand with Rachel went way too fast. 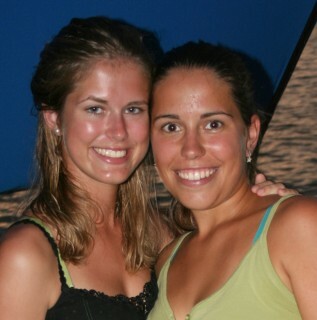 From day one, she was a pleasure to have aboard, and Amanda was thrilled to have a wonderful friend to be cruising with! Rachel considered prolonging her stay several times, and the only reason we let her go at all was because of her promise to come visit in Africa in December 2007. We await that next visit with great happiness and anticipation.